3 Bedroom Detached For Sale in Penzance for Guide Price £675,000. This is a great opportunity to buy an exceptionally presented detached property within the very popular location of Sennen. 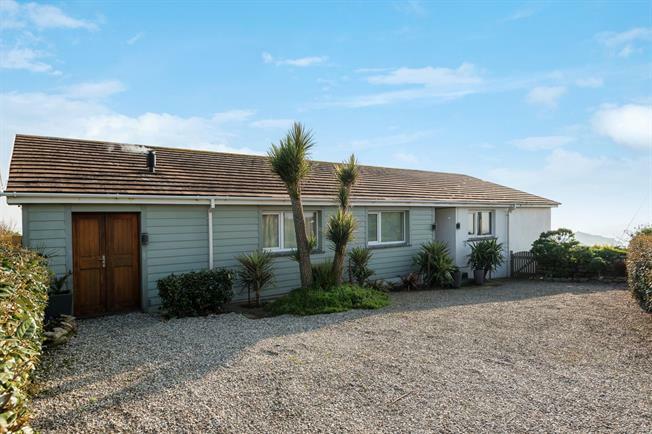 The property has stunning sea and rural views and also is within walking distance to Sennen Cove and the beach. This property has been highly successful as a high end holiday let or equally would be perfect for permanent or second home purposes. This is a rare opportunity to purchase a beautiful single level home finished to an immaculate standard throughout, on the edge of Sennen with outstanding sea and rural views. Situated within an area of outstanding natural beauty this property is located a few minutes walk from this very popular coastal village and sandy beach. The property has a southerly facing sunny rear garden, benefiting from some spectacular sunsets and has gardens wrapping around two sides. Currently run very successfully as a high end holiday let property which could easily be continued or naturally be enjoyed as a stylish home for discerning full time residents. Arriving at the property via a quiet lane you will first notice the tasteful and practical coastal feel cladding and ample driveway parking for multiple cars. As you enter the property the hallway leads you through the centre of the house giving access to the generous dual aspect sitting room which has outstanding rural views to the south and sea views to the east. This combination of both open rural and sea views are difficult to come across anywhere in the county. There are French doors that lead out onto the Alfresco dining area from the sitting room which is a real sun trap having both a southerly and westerly aspect. Further to the sitting room is an efficient gas fired contemporary stove and surround sound system which can be controlled if needed via Bluetooth. Adjacent to the sitting room is the spacious kitchen/dining room which is perfect for entertaining and has a large picture window which at first glance frames the superb coastal Cornish vista like a real life canvas. The kitchen is well equipped with a large variety of modern style units, work surfaces, two ovens and space for all appliances. Three bedrooms consisting of the south facing master bedroom has a generously proportioned en-suite bathroom and far reaching rural views. The remaining two double bedrooms both have built in wardrobes and have a choice of the shower room or separate bathroom directly opposite across the hallway. This impressive property is in a very desirable location and has expansive views of both a rural outlook to one side and sea views to another, these views really speak for themselves. The following services are available mains electric, Oil fired central heating, mains water, private drainage and telephone line is connected (however we have not verified connection).